The National Historical Commission of the Philippines highlighted the town of Borbon, Cebu, Philippines in the annals of Philippine History. It’s when the Grand Old Man of Cebu, President Sergio Osmena went into hiding after the Spaniards identified his involvement in the anti-Spanish uprising in Manila in 1897. Many Borbonanons especially young generations doesn’t exactly know this relevant piece of history. What we only learned about the Osmena’s, was that they belong to powerful political clans in Cebu and apparently their influence proliferates to the whole of Cebu and even in neighboring provinces. Evidently in our municipality, we have had a private high school in upland barangay named after Don Emilio Osmena and another elementary school named after Dona Mary Osmena among others, as cenotaphs of their bequest. Without knowing that no less than the Grand Old Man himself, was for one time, during the Spanish period came to our peaceful little town to take shelter and concealed from the preying eyes of the Spaniards. We brought up this topic in order to give relevance to one historical account where our town was mentioned by NHCP and for us, Borbonanons to have some sense of personal or rather historical gratifications. That Borbonanons are proud, warmth and friendly people willing to lend a hand for those who come to our aid. May it be the most powerful man in the country or the least fortunate in our society. But who is the Grand Old Man of Cebu? Sergio Osmeña is commonly associated with the Philippine fifty-peso bill since it bears his image. Popularly known as the “Grand Old Man of Cebu”, Osmeña rose from being a newspaper reporter to the Presidency of the Philippine Republic in1944-46. Juana Suico Osmeña was only fourteen years old when she gave birth to Sergio Osmeña on September 9, 1878. Sergio used Osmeña as family name since Juana was not officially married to anyone. 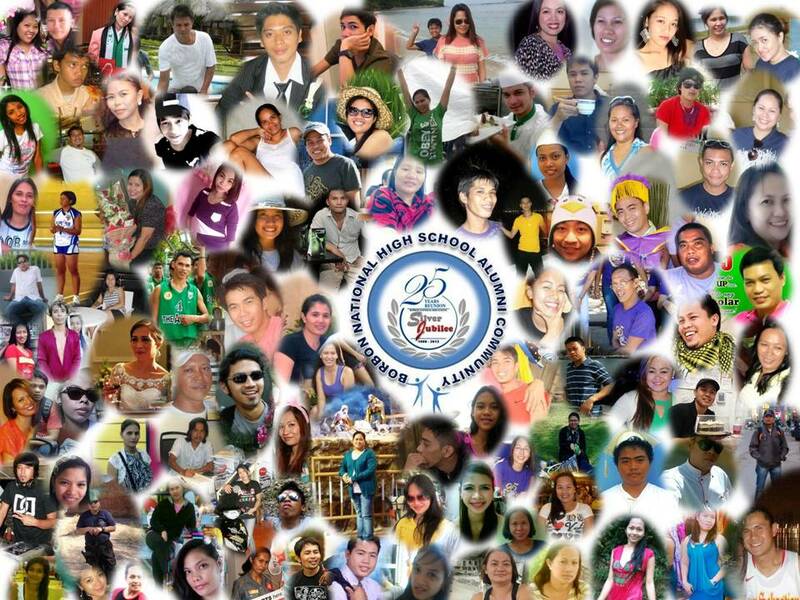 It is no secret in history that he grew up without knowing his father, but it didn’t hinder him from joining the roster of the iconic Filipino leaders. Sergio obtained his elementary education in a private school administered by Martin Medalle. He later entered the Colegio de Segunda Enseñanza under the supervision of Miguel Logarta. At the age of eleven, he enrolled in the high school of the Seminario Colegio de San Carlos, passing all of his subjects at the end of the year with a grade of sobresaliente. In 1894, Sergio transferred to Manila to study at the Colegio de San Juan de Letran, where he first met Manuel Quezon. He earned a degree in Bachelor of Arts, prior to his Law course in the University of Santo Tomas. He continued to support himself as a working student. In UST, Sergio and Emilio Jacinto were classmates. The outbreak of the Revolution in Manila forced Sergio to return to Cebu to continue his studies. He worked as a part-time court recorder for the Cebu Audiencia and a personal aide to the Spanish military governor of Cebu. At the same time, he was a contributor of articles to El Boletin de Cebu, the only provincial newspaper at that time; and to the Spanish Manila- based periodical, El Comercio. Sergio’s excellence as a journalist earned him the prestigious Medalla del Merito Civil. Sergio went back to Manila in 1897 to resume his studies. 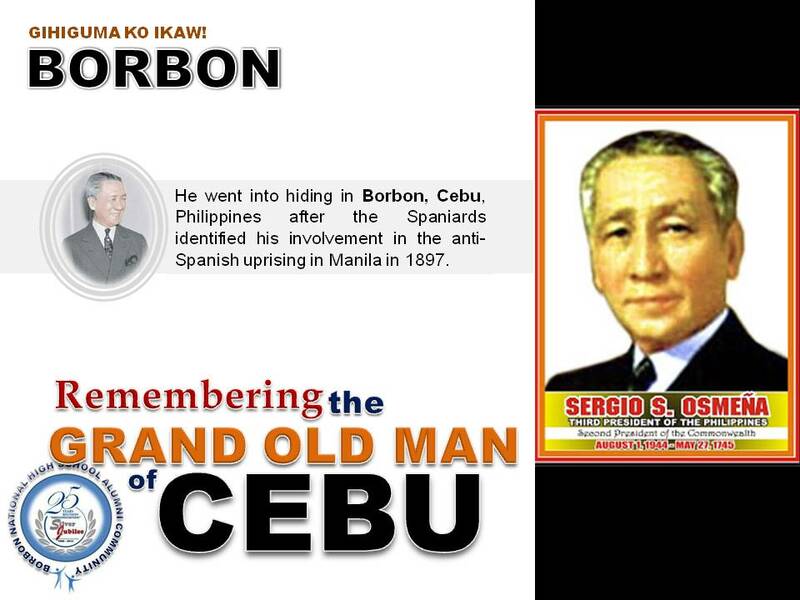 However, new anti-Spanish uprisings forced him to flee to Borbon in Cebu since he was identified with the Spaniards. Returning to Manila after two years, he covered the retreat of Emilio Aguinaldo for a Cebu newspaper. Sergio gave his support to the besieged republic, providing Aguinaldo updates with the developments in Cebu. He became an associate of Juan Climaco, an influential Cebuano illustrado and a republican. Before travelling to the north, Sergio met Estefania Chiong Veloso, daughter of Nicasio Chiong Veloso, a business tycoon in Cebu. He generously gave Sergio a capital of 30,000 pesos to establish the first daily periodical in the province; and on April 16, 1900, the first issue of El Nuevo Dia was published. Working with Rafael Palma and Jayme de Veyra, Osmeña put out El Nuevo Dia, not for the purpose of making a profit but to spread the concept of preserving liberty among the Filipinos. Sergio married Estefania on April 10, 1901. In 1903, he took the examination for aspiring lawyers, and placed second in the overall ranking with an average grade of 95.66, and got 100 percent in Penal Code and Civil Procedure. Resurfacing in Cebu in May 1903, Sergio was recognized as a nationalist after winning a case in favor of a former Filipino revolutionist who was charged with sedition. In December of the same year, with the support of Governor Juan Climaco, Sergio made his initial entry into politics after winning as municipal councillor. He was re-elected in the 1904 elections. Governor Climaco appointed him as acting provincial governor some time in 1904. Backed with his experience, he was victorious in the gubernatorial race of the 1905 elections. Sergio Osmeña won a seat in the Philippine Assembly in 1907, and was easily proclaimed as its first Speaker at twenty nine. At that time, the Speakership was the highest position that a Filipino could aspire for, being second only to the American governor-general. In 1916, the passage of Jones Law allowed the Filipinos to have a broader participation in the running of the government. It created a bicameral legislative system, composed of a lower house called the House of Representatives and an upper house known as the Senate. Sergio remained as House Speaker, while Quezon was elected as Senate President. Two years after Estefania died in 1918, Sergio married Esperanza Limjap who came from a wealthy clan. A Senator from 1922-35, he joined fellow Senator Manuel Roxas in the United States to lobby for Philippines independence at the American Congress. The OSROX Mission played a vital role in the approval of the Hare-Hawes-Cutting Act which was eventually replaced by the Tydings-McDuffie Act. Quezon and Osmeña ran as president and vice-president respectively in the 1935 elections for the Commonwealth government, beating their opponents with a huge margin. Manuel Quezon and Sergio flew to the United States when World War II broke out. The Commonwealth government was suddenly in exile, with Quezon remaining as President and Osmeña as Vice-President. On August 1, 1944, Manuel Quezon’s death in Saranac Lake, New York put Sergio Osmeña at the helm of a presidency in exile. He was with General Douglas MacArthur and his soldiers, when he returned to the Philippines, landing at the Red Beach, Palo, Leyte on October 20, 1944. The Commonwealth government, headed by Osmeña was re-established temporarily in Tacloban, Leyte on October 23, 1944. The Second World War ended in 1945. Sergio inherited a devastated country. Nevertheless, he showed that old age was not an obstacle to serve the country. He devoted his short term as president to the restoration of peace and order, providing health services for the Filipinos, handling issues of collaboration, re-establishment of foreign relations and reconstruction of cities destroyed by war. In the 1946 national elections, Sergio Osmeña lost to Manuel A. Roxas, but his character as a nationalist and statesman never vanished from the memory of the Filipinos. Until now, his descendants are very visible and active in Philippine politics, a manifestation that the Filipino people have trusted the Osmeñas through the decades. Truly, it is worthy to pay tribute to a man who fought for the liberty we enjoy today. President Sergio Osmeña: Peerless Filipino Statesman. President Sergio Osmeña Memorial Foundation, Inc. 1968.